From our scorching hot summers to our unpredictable winters- Houston lawns are exposed to extremes all year long. To keep your yard looking its best, you can trust the Houston lawn services of Total Lawn Care. We know Houston grass and understand what it takes to keep it green and lush throughout even the most extreme summer months. From fertilization and weed control to regular trimming and edging, we provide consistent Houston lawn services that you can rely on. All of our lawn maintenance workers are trusted Total Lawn Care employees, so you can rest easy knowing that your yard is in the hands of a qualified and vetted professional. Our crews wear Total Lawn Care uniforms and drive marked vehicles so that they are easily identifiable by homeowners, neighbors and security. 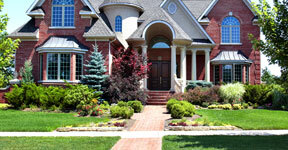 We pride ourselves in our prompt and reliable lawn service. When a Houston home owner has made an appointment for lawn services, we give a date and an estimated time so that you can know just when to expect us- and we always keep our appointments as long as Mother Nature allows. In the event of inclimate weather, our office staff will call and reschedule to a time that is convenient for you. From master-planned communities and apartment complexes to schools, retail centers, business parks and hotels- we offer reliable lawn care services to a range of commercial facilities in the Houston area. Let us set the right first impression for your business with clean, green, trim grass and tidy landscaping and walkways. With our commercial lawn care contracts, you can rest assured that you’ll receive consistent and reliable service for all your green areas.